Pour one out in style. 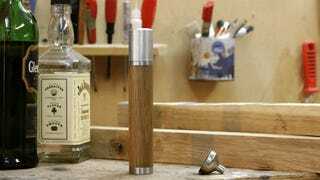 Nisnas Industries funded the Kole Elegant Flask on Kickstarter and delivered in a big (small and cylindrical) way. Handmade in stainless steel and locally sourced wood, it’s hard to say whether aesthetics or form factor are the Kole’s best feature. In addition to the flask itself and the lid/drinking cup, the Kole closes securely with a twist on cap, and includes a funnel for easy filling. The Kole isn’t going to keep beverages hot for ten years like your favorite travel mug, but it’s far better insulated than most flasks and again, far more portable than most (all) thermoses. That insulation makes the Kole a lot more appealing to non-drinkers as well, with capacity for four shots of espresso. I’m mildly concerned I may start every morning with a portable Irish coffee. Needless to say, the Kole makes an excellent gift, especially for yourself. Update 11/30/17: If you need to drink more, and no one could blame you at this point, check out the Upper Cut, with the same styling and insulation as the Kole and more capacity.